A more formal setup for a CA this time compared to the previous "Quick and Dirty" notes. First of all, install a fresh Ubuntu. I choose 12.04 LTS Server because of longer term support. Reboot the system, as the previous command also upgrade the kernel. Let's edit the defaults for OpenSSL in Ubuntu. Configuration file is located at /etc/ssl/openssl.cnf. You can also make changes to [ req_distinguished_name ] for different default values. This time, as we create a static CA. Let's put it in /opt/WhiteHat-CA (or any name you like under /opt that you specified in the configuration file above). We then secure it, making only root (sudoers) can access the CA. Since we secured the CA, if you need to operate the CA (execute openssl ca commands), you need to sudo in order to get have required permission. From management console, it does not allow you to import a private key. Sometimes if it is mandatory to pre-generate the key from another sources, you will not able to use the pre-generate key. assuming the installation folder is /opt/arcsight/logger. The private key file, must be not encrypted (-nodes), is called server.crt. The certificate file is called server.pem. 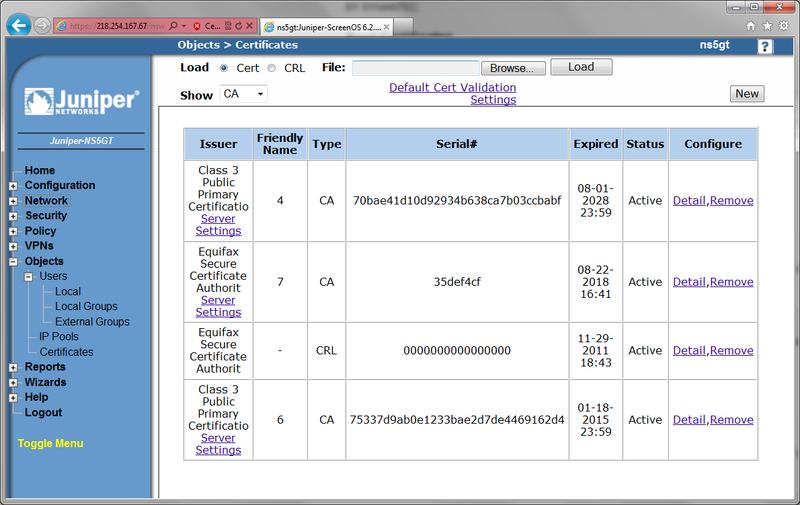 Replacing these two files with your own pre-generate private key and certificate, then restart the HP ArcSight Logger service. This makes the newly loaded private key and certificate effective. This is not officially supported by HP, I think. It is actually fairly easy. Default openssl options (on Ubuntu) points the CA to ./demoCA (a folder called "demoCA" in the currrent folder). openssl pkcs12 -export -in A.pem -inkey A.key -out A.p12 -name "A"
In order for your device to trust the cert (A.pem or A.p12), you will need to import the CA cert (./demoCA/cacert.pem). All in one shot! This example uses FortiOS 4.0 MR3 Patch 15 (FOS 4.3.15). You will need this information in setting up the user group in FortGate in later stage. In FortiGate, create a LDAPS entry. Then create the user group. The group-name here is the result comes from the command prompt output in the DC. Load a VPN cert. REMEMBER THE COMMON NAME OF THIS CERT MUST MARCH THE CONNECTING HOSTNAME. So if your iOS devices connects to vpn.example.com, then the common name of this cert must be the same. 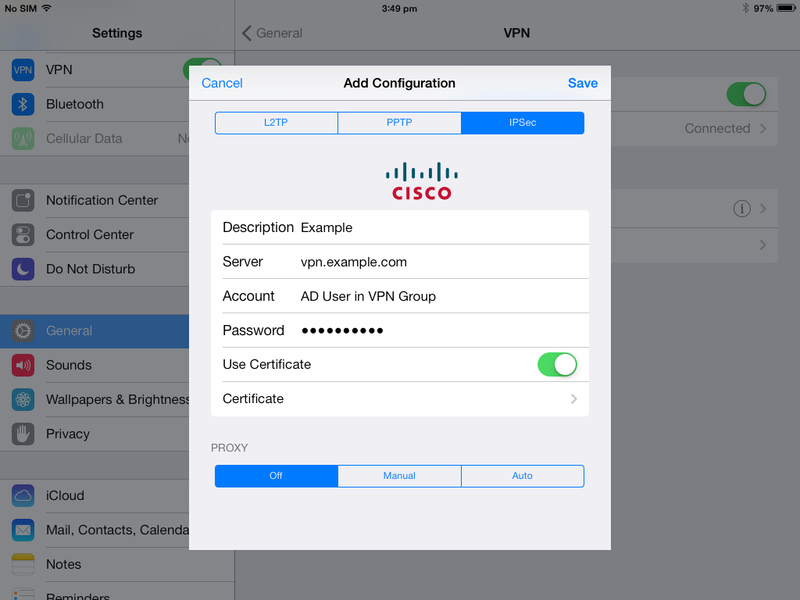 config vpn certificate caedit "ipad"
Create interface base Phase 1. 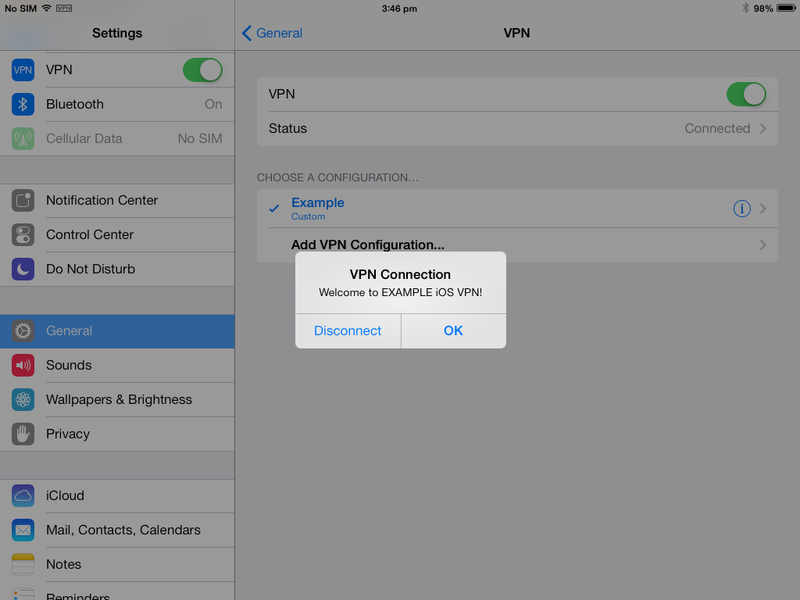 Assuming the WAN interface is called "wan"
set banner "Welcome to EXAMPLE VPN!" Make a static route for this newly created range. "0" here means to create a new entry. It would be nice to define this range in an address object. Create the firewall policy. Again "0" here means create a new entry. That's it for the FortiGate configuration. And you can﻿ enable the VPN, a welcome message will show up. FortiGate Cookbook shall include this.